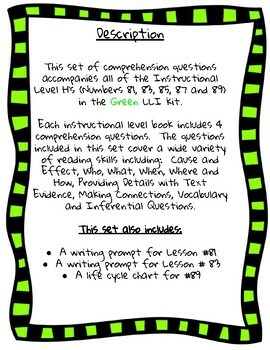 This set of comprehension questions accompanies all of the Instructional Level H’s (Numbers 81, 83, 85, 87 and 89) in the Green LLI kit. 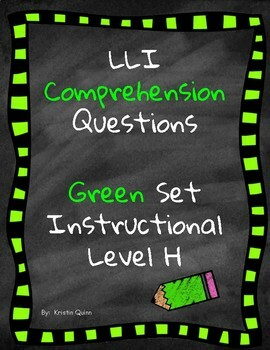 Each instructional level book includes 4 comprehension questions. 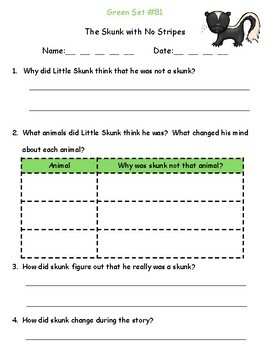 The questions included in this set cover a wide variety of reading skills including: Cause and Effect, Who, What, When, Where and How, Providing Details with Text Evidence, Making Connections, Vocabulary and Inferential Questions.